Rioters have set fire to a bank and ransacked stores on Paris’s landmark shopping street in a new flare-up of violence as part of France’s yellow vest protests. 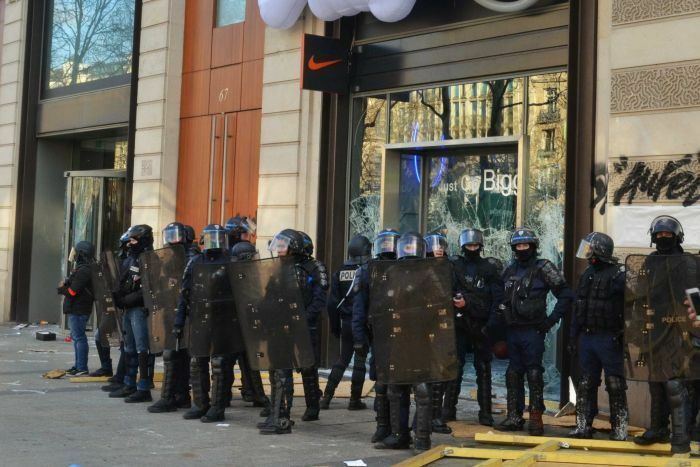 Police fired tear gas and water cannons on Saturday local time as the protests against President Emmanuel Macron and his pro-business reforms turned violent again after weeks of relative calm during marches and declining numbers of participants. A Banque Tarneaud branch spewed flames before firefighters arrived and rescued two people from the building, with 11 people suffering minor injuries, the fire department said. A mother and her child were saved from the flames on the second floor and other residents were safely evacuated. Two news stands on the Champs Elysees avenue caught fire and bonfires burned in the streets. 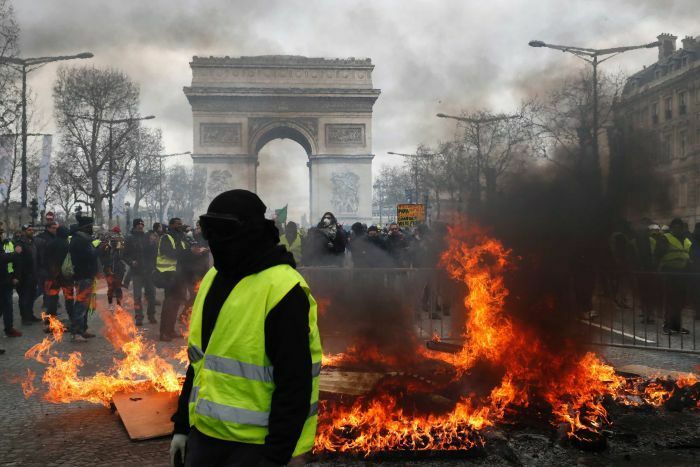 Protesters threw cobblestones at riot police through clouds of tear gas in front of the Arc de Triomphe monument in Paris, which was ransacked at the peak of the protests in December. 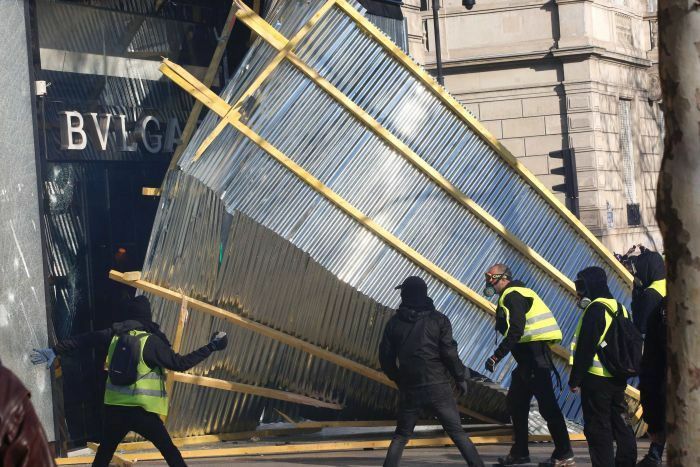 Police had arrested more 120 protesters by late afternoon as demonstrators looted stores around the Champs Elysees and ransacked the high-end Fouquet’s restaurant. The interior ministry estimated 10,000 people had participated in the protest in Paris, compared with 2,800 the previous Saturday. Elsewhere in France, protesters were estimated at 4,500, compared with 4,200 last week. 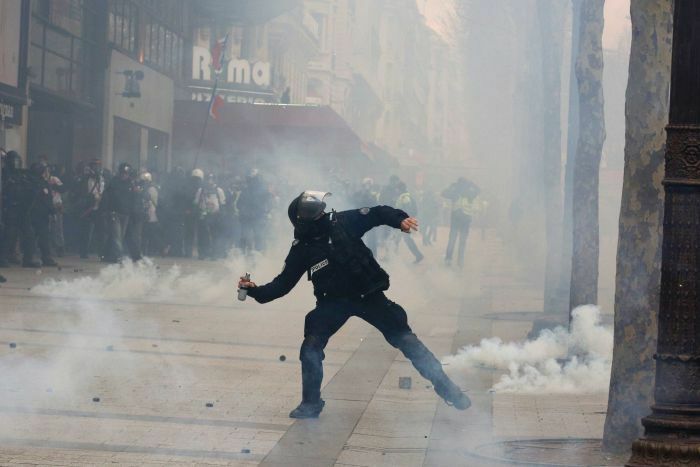 Interior Minister Christophe Castaner said although the protest was relatively small, there were more than 1,500 “ultra violent” people out looking for trouble. 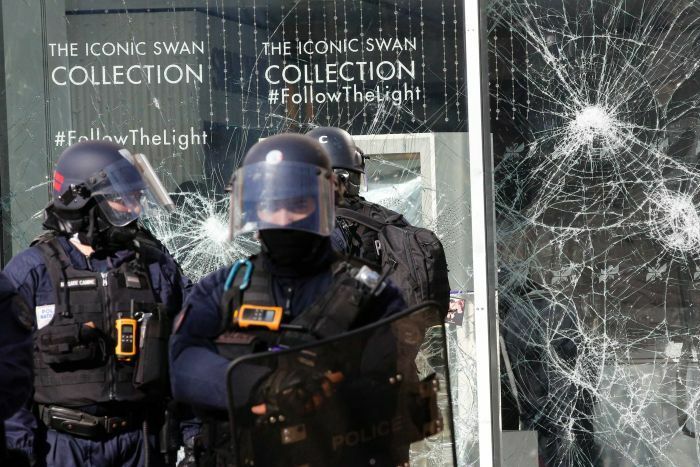 “They decided, perhaps as a swansong, to come attack — and I use their words — Paris,” he said. He said more than 1,400 police officers had been mobilised. Yellow vest protesters have promised to draw bigger numbers to mark the fourth month since the movement erupted in mid-November, over since-scrapped fuel tax hikes and the cost of living. 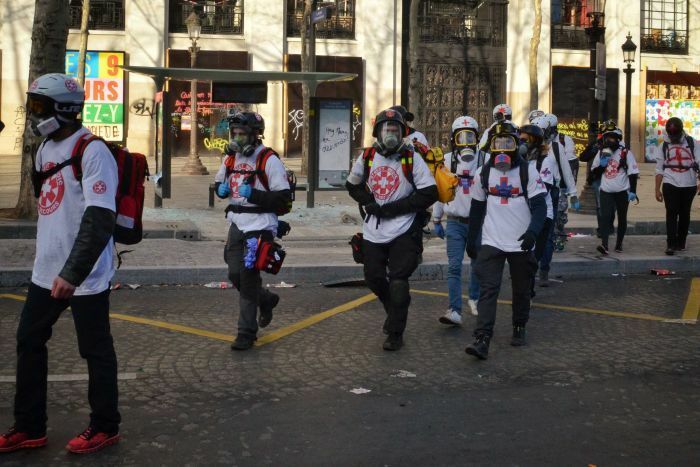 Named after the high-visibility vests French drivers have to keep in their cars and worn by protesters, the revolt swelled into a broader movement against Mr Macron and his reforms. After the spike in violence, Mr Macron offered a package of concessions worth more than 10 billion euros (almost $16 billion) aimed at boosting the incomes of the poorest workers and pensioners. His Government ordered police to crack down on the protests in January, leading to complaints of police brutality.